Smallpox is an acute contagious disease caused by variola virus, a member of the orthopoxvirus family. In some ancient cultures, smallpox was such a major killer of infants that custom forbade the naming of a newborn until the infant had caught the disease and proved it would survive. Smallpox killed Queen Mary II of England, Emperor Joseph I of Austria, King Luis I of Spain, Tsar Peter II of Russia, Queen Ulrika Elenora of Sweden, and King Louis XV of France. Blindness was another complication. In 18th century Europe, a third of all reported cases of blindness was due to smallpox. In a survey conducted in Viet Nam in 1898, 95% of adolescent children were pockmarked and nine-tenths of all blindness was ascribed to smallpox. As late as the 18th century, smallpox killed every 10th child born in Sweden and France. During the same century, every 7th child born in Russia died from smallpox. Edward Jenner's demonstration, in 1798, that inoculation with cowpox could protect against smallpox brought the first hope that the disease could be controlled. In the early 1950s – 150 years after the introduction of vaccination – an estimated 50 million cases of smallpox occurred in the world each year, a figure which fell to around 10–15 million by 1967 because of vaccination. In 1967, when WHO launched an intensified plan to eradicate smallpox, the "ancient scourge" threatened 60% of the world's population, killed every fourth victim, scarred or blinded most survivors, and eluded any form of treatment. Smallpox had two main forms: variola major and variola minor. The two forms showed similar lesions. The disease followed a milder course in variola minor, which had a case-fatality rate of less than 1 per cent. The fatality rate of variola major was around 30%. There are two rare forms of smallpox: haemorrhagic and malignant. In the former, invariably fatal, the rash was accompanied by haemorrhage into the mucous membranes and the skin. Malignant smallpox was characterized by lesions that did not develop to the pustular stage but remained soft and flat. It was almost invariably fatal. The incubation period of smallpox is usually 12–14 days (range 7–17) during which there is no evidence of viral shedding. During this period, the person looks and feels healthy and cannot infect others. The incubation period is followed by the sudden onset of influenza-like symptoms including fever, malaise, headache, prostration, severe back pain and, less often, abdominal pain and vomiting. Two to three days later, the temperature falls and the patient feels somewhat better, at which time the characteristic rash appears, first on the face, hands and forearms and then after a few days progressing to the trunk. Lesions also develop in the mucous membranes of the nose and mouth, and ulcerate very soon after their formation, releasing large amounts of virus into the mouth and throat. The centrifugal distribution of lesions, more prominent on the face and extremities than on the trunk, is a distinctive diagnostic feature of smallpox and gives the trained eye cause to suspect the disease. Lesions progress from macules to papules to vesicles to pustules. All lesions in a given area progress together through these stages. From 8 to 14 days after the onset of symptoms, the pustules form scabs which leave depressed depigmented scars upon healing. In the past, smallpox was sometimes confused with chickenpox, a worldwide infection of children that is seldom lethal. Chickenpox can be distinguished from smallpox by its much more superficial lesions, their presence more on the trunk than on the face and extremities, and by the development of successive crops of lesions in the same area. Smallpox is a disease which can be easily diagnosed by trained health workers without the need for laboratory support. During the eradication campaign, WHO produced training materials designed to help health staff recognize smallpox, distinguish it from chickenpox, and avoid common diagnostic errors. These materials are now available electronically. Persons carrying the virus during the incubation period cannot infect others. The frequency of infection is highest after face-to-face contact with a patient after fever has begun and during the first week of rash, when the virus is released via the respiratory tract. Although patients remain infectious until the last scabs fall off, the large amounts of virus shed from the skin are not highly infectious. Exposure to patients in the late stages of the disease is much less likely to produce infection in susceptible contacts. As a precaution, WHO isolation policy during the eradication campaign required that patients remain in isolation, in hospital or at home, until the last scab had separated. In the absence of immunity induced by vaccination, human beings appear to be universally susceptible to infection with the smallpox virus. There is no animal reservoir. Insects play no role in transmission. Smallpox is transmitted from person to person by infected aerosols and air droplets spread in face-to-face contact with an infected person after fever has begun, especially if symptoms include coughing. The disease can also be transmitted by contaminated clothes and bedding, though the risk of infection from this source is much lower. In the past, patients suffering from variola major (the more severe form of the disease) became bedridden early (in the phase before the eruption of rash) and remained so throughout the illness. Spread of infection was limited to close contacts in a small vicinity. Variola minor, however, was so mild that patients infected with this form frequently remained ambulatory during the infectious phase of their illness and thus spread the virus far more widely. During the eradication campaign, investigations of outbreaks caused by importations of cases into industrialized countries in temperate areas showed that, in a closed environment, airborne virus could sometimes spread within buildings via the ventilation system and infect persons in other rooms or on other floors in distant and apparently unconnected spaces. This mode of transmission is not important in those tropical areas where houses and hospitals do not use ventilation systems. Epidemics develop comparatively slowly. The interval between each generation of cases is 2–3 weeks. When natural outbreaks occurred, the initial, or "index", case rarely infected as many as 5 other persons, even during the peak transmission season. On some occasions, such as the outbreak that followed importation of a case into Yugoslavia in 1972, index cases infected more than a dozen people. Unfortunately, historical data are available only from periods with substantial population immunity either from vaccination or from having survived natural infection. In the absence of natural disease and vaccination, the global population is significantly more susceptible. Some experts have estimated today's rate of transmission to be more on the order of 10 new infections per infected person. Vaccine administered up to 4 days after exposure to the virus, and before the rash appears, provides protective immunity and can prevent infection or ameliorate the severity of the disease. No effective treatment, other than the management of symptoms, is currently available. A number of compounds are under investigation as chemotherapeutic agents. One of these, Cidofovir, has produced promising results in laboratory studies. Emphasis must be placed on preventing epidemic spread. In doing so, it should be kept in mind that smallpox patients are not infectious during the early stage of the disease but become so from the first appearance of fever and remain so, though to a lesser degree, until all scabs have separated. Also, immunity develops rapidly after vaccination against smallpox (see above). Surveillance of smallpox infection is probably easier than for any other infectious disease. A distinctive rash is produced (see above) which is wholly characteristic in the great majority of cases. The rash is most dense over the face and hands – unclothed and readily visible portions of the body. Experiences from the eradication campaign indicate that, in the presence of a strong surveillance system sensitive to smallpox cases and backed by an adequate infrastructure, small but rapid and thorough containment actions can break the transmission chain and halt a smallpox outbreak within a relatively short time. Containment involves efficient detection of cases and identification and vaccination of contacts. Patients diagnosed with smallpox should be physically isolated. All persons who have or will come into close contact with them should be vaccinated. As hospitals have proven to be sites of epidemic magnification during smallpox outbreaks, patient isolation at home is advisable where hospitals do not have isolation facilities. Whatever the policy, isolation is essential to break the chain of transmission. Patients who developed rash before their isolation should be asked to recount all recent contacts. Contacts should be vaccinated. If it is not feasible to vaccinate contacts, they should be placed on daily fever watch, which should continue up to 18 days from the last day of contact with the case. If these contacts have two consecutive readings of 38 degrees centigrade or above, they should be isolated. All specimen collectors, care givers and attendants coming into close contact with patients should be vaccinated as soon as smallpox is diagnosed as the cause of an outbreak. In the case of a widespread outbreak, people should be advised to avoid crowded places and follow public health advice on precautions for personal protection. Medical care givers, attendants, and mortuary workers, even if vaccinated, should wear gloves, caps, gowns, and surgical masks. All contaminated instruments, excretions, fluids and other materials should be decontaminated chemically or by heat or incineration. Contaminated clothing and bedding, if not incinerated, should be autoclaved or washed in hot water containing hypochlorite bleach. Fumigation of premises may be done with formaldehyde. Cadavers should be cremated, in a properly designed facility, whenever possible and all persons coming in contact with them should be vaccinated or at least placed on daily fever watch. Body bags treated with hypochlorite bleach can also be used. Laboratory manipulations with infective materials should be done in high containment facilities at Biosafety Level IV, authorized only at two WHO designated laboratories in the United States and the Russian Federation. Smallpox vaccine contains live vaccinia virus, a virus in the orthopoxvirus family and closely related to variola virus, the agent that causes smallpox. Immunity resulting from immunization with vaccinia virus (vaccination) protects against smallpox. In December 1999, a WHO Advisory Committee on Variola Virus Research concluded that, although vaccination is the only proven public health measure available to prevent and control a smallpox outbreak, current vaccine supplies are extremely limited. The Committee also noted that, at that time, several countries were contemplating the need to produce more vaccine stocks. Now, a number of governments have chosen to examine their stocks, test their potency, and consider whether more vaccine is required. A WHO survey conducted in 1998 indicated that approximately 90 million declared doses of the smallpox vaccine were available worldwide. Storage conditions and potency of these stocks are not known. Most existing vaccine stocks and the vaccine used in the WHO eradication campaign consist of pulp scraped from vaccinia-infected animal skin, mainly calf or sheep, with phenol added to a concentration sufficient to kill bacteria but not so high as to inactivate the vaccinia virus. The vaccine is then freeze dried and sealed in ampoules for later re-suspension in sterile buffer and subsequent intradermal inoculation by multiple puncture with a bifurcated needle. The seed virus (vaccinia virus strain Lister Elstree) used to produce the vaccine is being held for WHO by the WHO Collaborating Centre for Smallpox Vaccine in Bilthoven, the Netherlands. This Centre also tests batches of the smallpox vaccine for potency every five years. Vaccines properly stored for as long as 18 years have not lost their potency. Vaccination usually prevents smallpox infection for at least ten years. If symptoms appear, they are milder and mortality is less in vaccinated than in nonvaccinated persons. Even when immunity has waned, vaccinated persons shed less virus and are less likely to transmit the disease. Existing vaccines have proven efficacy but also have a high incidence of adverse side-effects. The risk of adverse events is sufficiently high that vaccination is not warranted if there is no or little real risk of exposure. Vaccine administration is warranted in individuals exposed to the virus or facing a real risk of exposure (see above). A safer vaccinia-based vaccine, produced in cell culture, is expected to become available shortly. There is also interest in developing monoclonal anti-variola antibody for passive immunization of exposed and infected individuals, which could also be administered to persons infected with HIV. Vaccination is contraindicated for certain groups. These include pregnant women, persons with immune disorders or experiencing therapeutically-induced immunosuppression, persons with HIV infection, and persons with a history of eczema. Should national authorities decide that the risk of epidemic spread is so great that such groups should receive protection, it may be advisable to attempt to limit adverse effects through intramuscular administration of vaccinia immune globulin, if available, from vaccinia-infected sheep or calves. The causative agent, variola virus, is a member of the genus Orthopoxvirus, subfamily Chordopoxvirinae of the family Poxviridae. Other members of the genus include cowpox, camelpox, and monkeypox. Monkeypox virus has caused the most serious recent human poxvirus infections. Variola virus is relatively stable in the natural environment. If aerosolized, it probably retains its infectivity for at least several hours if not exposed to sunlight or ultraviolet light. The variola virus measures 260 by 150 nanometers and contains a molecule of double-stranded DNA putatively coding for some 200 different proteins, one of the largest viral genomes known. The size of the genome makes it especially difficult to create a synthetic copy of the virus. The WHO Orthopoxvirus Committees meeting in 1994 and 1999 have recommended that no one other than the two WHO collaborating centres in the United States and the Russian Federation may have in possession at one time more than 20% of the viral DNA for variola virus. 1. Site of vaccination. Outer aspect of upper arm over the insertion of deltoid muscle. 2. Preparation of skin. None. If site is obviously dirty, a cloth moistened with water may be used to wipe the site. Use of a disinfectant can kill the vaccine virus. 3. Withdrawal of vaccine from ampoule. A sterile bifurcated needle (which must be cool) is inserted into the ampoule of reconstituted vaccine. On withdrawal, a droplet of vaccine, sufficient for vaccination, is contained within the fork of the needle. 4. Application of vaccine to the skin. The needle is held at a 90 degree angle (perpendicular) to the skin. The needle then touches the skin to release the droplet of vaccine. 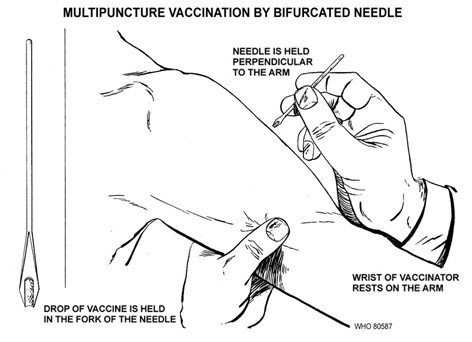 For both primary and revaccination, 15 up and down (perpendicular) strokes of the needle are rapidly made in the area of about 5mm in diameter (through the drop of vaccine deposited on the skin). The strokes should be sufficiently vigorous so that a trace of blood appears at the vaccination site. If a trace of blood does not appear, the strokes have not been sufficiently vigorous and the procedure should be repeated. Although it is desirable not to induce frank bleeding, the proportion of successful takes is not reduced if bleeding does occur. 5. Dressing. No dressing should be used after vaccination. 6. Sterilization. WHO strongly recommends the use of disposable needles. 7. Unused vaccine. Unused, reconstituted freeze-dried vaccine should be discarded at the end of each working day. Four main complications are associated with vaccination, three of which involve abnormal skin eruption. Eczema vaccinatum occurred in vaccinated persons or unvaccinated contacts who were suffering from or had a history of eczema. In these cases, an eruption occurred at sites on the body that were at the time affected by eczema or had previously been so. These eruptions became intensely inflamed and sometimes spread to healthy skin. Symptoms were severe. The prognosis was especially grave in infants having large areas of affected skin. Progressive vaccinia (vaccinia necrosum) occurred only in persons who suffered from an immune deficiency. In these cases the local lesion at the vaccination site failed to heal, secondary lesions sometimes appeared elsewhere on the body, and all lesions spread progressively until – as was likely – the patient died, usually 2–5 months later. As vaccination ceased in most countries prior to the emergence of HIV/AIDS, the consequences of the currently much larger pool of persons suffering from immunodeficiency were not reflected in recorded cases of progressive vaccinia. Generalized vaccinia occurred in otherwise healthy individuals and was characterized by the development, from 6–9 days after vaccination, of a generalized rash, sometimes covering the whole body. The prognosis was good. Postvaccinial encephalitis, the most serious complication, occurred in two main forms. The first, seen most often in infants under 2 years of age, had a violent onset, characterized by convulsions. Recovery was often incomplete, leaving the patient with cerebral impairment and paralysis. The second form, seen most often in children older than 2 years, had an abrupt onset, with fever, vomiting, headache, and malaise, followed by such symptoms as loss of consciousness, amnesia, confusion, restlessness, convulsions and coma. The fatality rate was about 35%, with death usually occurring within a week. The best estimates of the frequency of these complications come from a 1968 study conducted by the United States involving over 14 million vaccinated persons. Altogether nine deaths occurred. Progressive vaccinia occurred in 11 persons, with 4 deaths. Eczema vaccinatum was more common, with 74 cases and no deaths. Sixty additional cases of eczema vaccinatum occurred in contacts of vaccinated persons, with one death. Generalized vaccinia occurred in 143 cases, with no deaths. Encephalitis was observed in 16 persons, with 4 deaths. On the basis of this study, it was estimated that approximately one death per million resulted from complications following primary vaccination and one death per four million following revaccination. How long does immunization remain effective – a lifetime or only a certain number of years? This is difficult to answer with great precision, as all available data come from the time prior to the global eradication of smallpox, which was certified in 1979. When smallpox was still occurring naturally, populations in endemic countries were exposed to the virus. In some countries, subclinical infection with the virus occurred rather frequently among vaccinated persons, thus boosting their immunity. Edward Jenner, who developed the vaccine in 1798, believed that successful vaccination produced lifelong immunity to smallpox. That view was clearly wrong. Data from the eradication campaign make it clear that immunity wanes with time. This is why, prior to the certification of eradication, periodic revaccination was recommended, for example, for international travellers. For the general population, revaccination at a 5–10-year interval for non-endemic countries and at a 3-year interval for endemic countries was recommended. In certain high-risk groups requiring maximum protection, such as staff working in smallpox diagnostic laboratories, revaccination every year was recommended by WHO as a precaution. Vaccination five years prior to exposure provides a high level of protection against smallpox. High levels of protection are generally believed to last 10 years after vaccination. Beyond this 10-year interval, where the evidence of protection is strong, the data are conflicting and difficult to interpret. Some studies found some degree of protection against smallpox for as long as 30 years after vaccination. However, other studies demonstrated very little or no immunity 20 years after vaccination. A large study, published in 1913, found substantial protection even in persons, vaccinated as children, aged more than 50 years. One study of smallpox following the importation of cases into Europe and Canada (1950–1971) showed that mortality was 52% in unvaccinated persons, 1.4% in those vaccinated up to 10 years before exposure, and only 11% in those vaccinated over 20 years before exposure. For the age group of 10–49 years, the mortality rate was 49% in the unvaccinated and 4.3% in those vaccinated 20 years earlier. What age groups would need to worry about vulnerability to smallpox if an outbreak occurred today? Smallpox eradication was a global campaign, and populations were protected by vaccination in every country. However, during the campaign, different forms of smallpox occurred, and different vaccines and vaccination techniques were used. The duration of protection can be influenced by the potency of the vaccine and the inoculation procedure used. These factors make it difficult to give firm, precise estimates that are relevant today, where populations no longer have widespread immunity, either from vaccination or from having survived the disease (patients who survived smallpox were immune for life). Another factor that makes it difficult to make projections today based on historical data is the much larger pool of persons suffering from weakened immune systems. This can be because of immune disorders, therapeutically-induced immunosuppression, as in the case of chemotherapy, or clinical AIDS. A person's immune status affects both susceptibility to infection and the risk of adverse outcomes following vaccination. Immunization stopped in many countries, such as the US, in 1972. In 1979, WHO recommended that vaccination against smallpox be stopped in all countries, the only exception being special groups, such as researchers working with smallpox and related viruses. By 1982, routine vaccination had been officially discontinued in 149 of the 158 member countries of WHO. By 1986, routine vaccination had ceased in all countries. It is particularly important to understand that when vaccinated persons nonetheless contracted smallpox, the illness was usually considerably milder than that seen in unvaccinated persons. We know from experiences in early 19th century Europe, when natural smallpox was still widespread, that when the disease appeared in adults who had been vaccinated as children, the mortality rate was much lower and the symptoms were different and milder than in unvaccinated persons. Patients also appeared to be less infectious and thus less likely to spread the disease to close contacts. This would certainly affect the dynamics of a smallpox outbreak today all over the world, where the vast majority of adults were vaccinated as children. Vaccination also influenced the frequency of different clinical types of smallpox among persons who did contract the disease. Among vaccinated persons who subsequently contracted the disease, a mild form of smallpox (modified-type smallpox), which was hardly ever fatal, was much more common.